I have 2. My first is a '90s Custom Telecaster that some call an Anniversary model because they all have an anniversary sticker on the back of the peghead. But it is a Strat anniversary that all Fender guitar in 1997 had. They issued two of them. Both made in Japan. One white with white pearl binding and pickguard and the other a black one with black/silver pearl binding and pickguard. They both have gold parts. I have a black one and put Fralin pickups on it and changed the knobs for abalone topped ones from Guitar Fetish. Fender even had guitar straps made by Levy with white or black/silver pearloid. Showiest guitar I have. 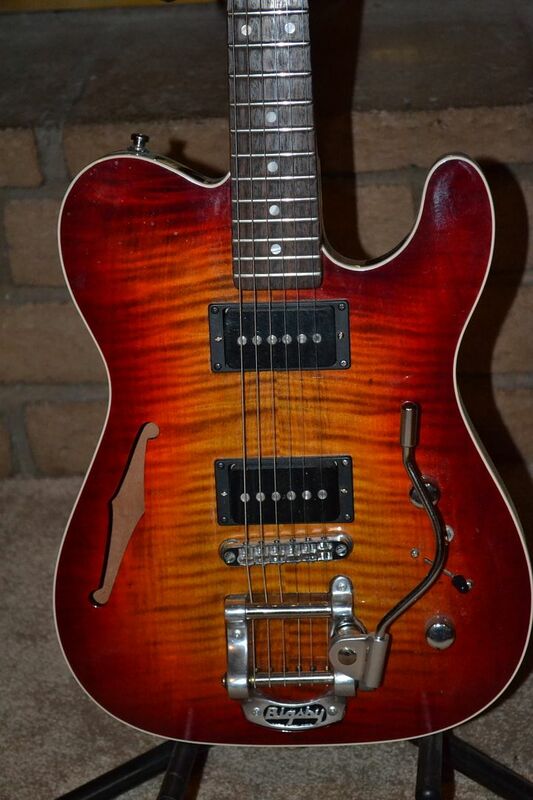 The second one I have is a G&L ASAT Deluxe Thinline and it is no slouch in the looks department either. I bought it second hand and someone had switched out the SD Humbuckers for Harmonic Design Z-90s. I changed the Bigsby handle for a Chet one. Last edited by dbirchett; 03-17-2019 at 09:56 PM. Still don't know how to post pics since the photobucket thing doesn't work any more, but I remembered I have a video up of that partscaster I did with the Kay Kleenex box pickups! Damn nice pickin' Mr Sandman - outstanding! Maybe I'll learn how to play one day. Man there are some incredible guitars on here!!! 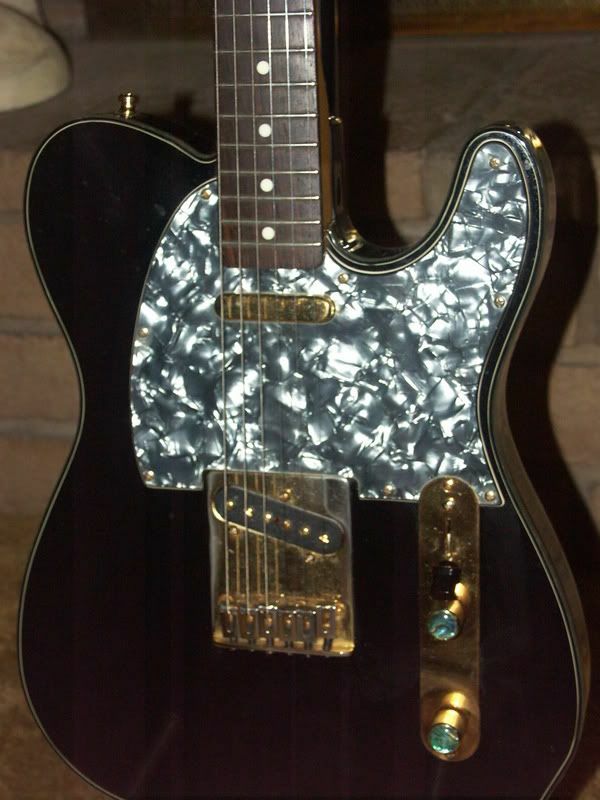 That’s my kind of Tele! Great playing, Walter. I love the Kay P/U’s and improved switch on your WB model Tele. Very Well done! The communal band axe is a Classic '60s MIM Tele like this one, and it's pretty! Bought on Bill Ashton's recommendation, and everybody seems pleased with it. Awesome, it's rare when a Tele doesn't look good ;-) I think that's called Burgundy Mist. Here's my one and only for the last ten years, here it is at almost ten pounds crushing the bed... Since Jenny Craig (4lb MJT body), now a more manageable 6lb 15oz. I'll have to get a new pic, the grain on the MJT body isn't perfect, but more interesting than the Fender body was, and much more see through. In some of these really old details shots, you can the nice natural aging of the guitar parts and case. Last edited by Guildedagain; 03-18-2019 at 07:43 PM. Three more down in here, limit on each post.